Courtesy of the artists Bela Fleck (right) and Abigail Washburn play the Van Duzer Theatre on Wednesday, Nov. 29 at 7 p.m. It's finally here. That most musical of feast days when we celebrate the gift of harmony with the rapturous delight of food. That most sacred day of eating for the musician and music fan alike. I am, of course, talking about the Wednesday, Nov. 22 feast day of Saint Cecilia, the patron saint of music. An early Roman martyr, Cecilia earned her stripes by singing from her heart and soul during the feast for her wedding to a pagan lord as a means to preserve her virtue. She was later beheaded for her efforts. As anyone who has been to a wedding (pagan or otherwise) or a feast knows, the preservation of anything virtuous during such events can often seem to require divine aid or intercession. Flippancy aside though, the connection to music as a means to transcend a difficult period in one's life is a universal concept which should easily be appreciated by the religious and secular alike. We need art and sound to guide us through this whole thing, don't we? So here's an idea, how about during that other feast this week, which many of us are going to be attending and stuffing ourselves at, we take some time to appreciate the things that carry us through our trials and our triumphs. And if we look around us and are fortunate enough to see family, friends and our personal coterie of loved ones, and feel more triumph than trial, how about we break some of that good stuff off and share it with somebody else nearby who doesn't have all that going on right now? Happy Thanksgiving. It's Thanksgiving. And no matter how you feel about this holiday — whether you have the option to gorge with loved ones or you are one of the unmentioned many, stuck on the outside of this family feast day and looking into brighter windows — things tend to freeze up on this day. I can't endorse a live show today because vastly powerful societal mores have deemed this a closed session for nearly all our live music venues. But don't let that stop you from celebrating the spirit of live music. Pick up a guitar and spend 20 minutes learning a meaningful three- or four-chord song. Might I suggest "Freight Train" by Elizabeth Cotton, "Blowin' in the Wind" by Bob Dylan or that old classic "Louie, Louie?" How about the entire Ramones discography? That would make for some fun sing-alongs for the post-prandial digestion period that too many families waste on football. How about just singing some good songs solo or a cappella with your family, like "Amazing Grace," or "Girls Just Wanna Have Fun?" Rejoice and make noise, whether on your own or with kin (which can sometimes feel like being alone, too). Enjoy the day and find music. The North Coast Repertory Theater continues its run of the musical Pippin at 8 p.m., a story about a prince journeying through an unusual world and trying to find his own place. With music and lyrics by Stephen Schwartz and based on the book by Roger O. Hirson ($16-$18). At 9 p.m. the Griffin hosts its Loose Joints Review, a free night of dance music curated by DJ Knutz & friends. Come one, come all, and dance your knutz off. Two vinyl-spun jiggle fests await your pleasure tonight: The remade/remodeled Soul Night at Humbrews at 9 p.m. has mutated into the similar-but-new Soul Party. This is the fifth show of the rechristened Mark 2 version of that old Humboldt classic soul dance vinyl revue. Familiar face DJ Red joins Jaymorg, Tanasa and other friends for some hip-slipping licorice-whipped tracks ($5). Meanwhile, over at the Alibi, the Radio Clash party kicks off at 11 p.m. with its new institutional sound of New Wave and Punk dance anthems deftly curated by the dedicated hands (and ears) of record spinners DJ Blancatron and DJ Anya ($2). Dance your misbegotten calories away with the lean chops and tight breaks these maestros create. Iris Dement has been writing songs for more than 30 years but her very first song, "Our Town," which she wrote at the age of 25, might still be her most enduring. Its plain and plaintive liturgy about home and the people who live there crosses the geography of the earth and sets up street signs in the heart and the soul without obviously demarcating the train tracks dividing those zones. Her words describe the simple beauty of an old lover's face, which reminds you of youth or a broken-down car, which reminds you of real freedom. She was one of my late mother's favorite songwriters and my mother was nothing if not a real fan of simple and profound sentiment in songwriting. If you have tickets to Dement's sold-out show at the Old Steeple at 7:30 p.m. tonight, don't be surprised if you see a guy who looks like me in the back of the room smiling through damp eyes ($50, $45 advance). The Humboldt State University music department hosts a trumpet and horn recital at Fulkerson Hall at 8 p.m. (price TBA). Expect solo pieces and concertos played with bright impeccability and executed with the eager embouchure of the dedicated young novice musician. Possibly the greatest bluegrass group on the planet will be visiting Humbrews tonight at 8 p.m. when Del McCoury brings his band to our wet, green grasslands ($40). In a half century of playing, McCoury has worked his magic with everyone from the legendary Bill Monroe to contemporary noodlers Phish, all the while maintaining his reputation as the heart, soul and technical master of the genre. As our stars and geniuses grow older and blink out, we must remember to witness them, if only for an evening, so we can carry their music with us to enrich the rest of our lives. This is one such evening. Two blocks over at the Arcata Theater Lounge, a different set of legends takes the stage at 9 p.m. as Israel Vibration returns to Humboldt County to sing soulful reggae harmonies for a fresh generation's ears while backed by the ever-faithful backing band Roots Radic. Rude Lion opens. ($25). 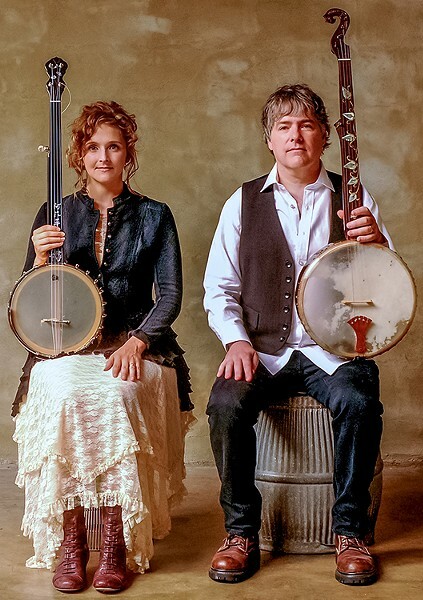 It just so happens that arguably two of the greatest living banjoists, Bela Fleck and the Mandarin-fluent polymath Abigail Washburn, are also husband and wife. And they must really love each other, as they tour and play together quite frequently, a lifestyle that would certainly put a fatal strain on a less harmonious union. Tonight at 7 p.m. we are lucky enough to have their near-decade musical honeymoon make a pit-stop at the Van Duzer theater for a night of picking and intimate musical interplay courtesy of the two masters themselves ($56). Collin Yeo is thankful for history books, which teach the unpleasant truths around American holidays, the freezing rain, which separates the lifers from the casuals in Humboldt County, the sense of charity and goodwill alive in the local saints in our community, and the Charlie Brown Christmas Album, which he will be listening to from now until Easter. He lives in Arcata.